An online safeguarding training course written specifically for equestrian Safeguarding Officers/Welfare Officers in association with the British Equestrian Federation. This course is designed as refresher training for anyone who has already taken the BEF face-to-face Safeguarding course. Covering both child and adult safeguarding the course uses equestrian specific scenarios and questions to enhance your learning. Please note: It is a requirement of the British Equestrian Federation that professionals attend a BEF face-to-face safeguarding training course within the 3 years prior to taking this course as refresher training. I really liked the short tests at the end of the modules as they were a good indicator of how much information I had retained and digested correctly. It made the course quite interactive. I also found all the links to documents and websites, as well as the downloads very useful. Thank you very much. Suitable for the Safeguarding Officer who has already completed introductory safeguarding training. Our online learning management system has been built to solve the problem of maintaining central records for all safeguarding and child protection training and ensuring that everyone’s training is current and up-to-date. If an inspecting body wants to check your records, simply use our website to display a full record of your training certificates. Is this training suitable for all equestrian staff? 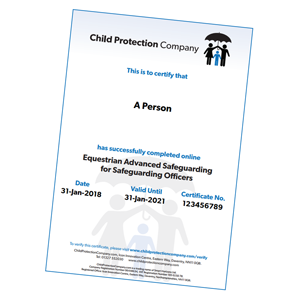 The Equestrian Advanced Safeguarding for Safeguarding Officers online training course is designed for those who hold a safeguarding position at a local level, the role may be known as Safeguarding Officer, Club Welfare Officer, Nominated Safeguarding Officer, Safety Officer or similar. However, if you are working as a professional in the equestrian sector but do not hold the Safeguarding role within your organisation/stable/club then you should take our Equestrian Advanced Safeguarding course. Please note: It is a requirement of the British Equestrian Federation that professionals attend a BEF face-to-face safeguarding course within the 3 years prior to taking this advanced course as refresher training. I work in England/Wales/Scotland/Northern Ireland. Will this course cover my requirements? This course covers the safeguarding requirements for England, Scotland, Wales and Northern Ireland. When you begin the course, you will be offered a choice of location. Your learning channel is designed to meet the needs of local legislation and guidance depending on the country you select. Upon successful completion of the course, you’ll be able to download a personalised training course certificate valid for 3 years. This module will give you an overview of child and adult safeguarding and the relevant guidance which informs policy and practice. You will be given an overview of the role of the Safeguarding Officer within the equestrian setting. It is important that you have refreshed your knowledge and are ready to include basic protection awareness into the learning that will follow. So, this section of the course will take you through some familiar ground. By the end of this module, you will have refreshed your knowledge of the different kinds of abuse you may encounter and what signs could indicate someone is a victim of abuse. We will also remind you of the importance of impartiality about abuse, confidentiality and the need to remain child- and person-focused. By the end of the module, you will be able to understand the relationship between the guidance and the law and will know your role within the protection process. The Safeguarding Officer is pivotal in maintaining an effective protection process and a culture of safeguarding within an organisation. This module is key to understanding the function of the Safeguarding Officer and the importance of the role. By the end of this module, you will have a better understanding of how to act as a central contact for safeguarding, your role in compiling or creating policies, and when and where to seek advice or guidance if needed. One of the areas that the Safeguarding Officer will cover is the encouragement and maintenance of good lines of communication. Protection and safeguarding are much more effective when barriers to communication are removed and opportunities for disclosure and appropriate information sharing are maximised. By the end of this module, you will better understand the need for clear communication, the importance of safe information sharing, and the role played by the Safeguarding Officer in creating a culture of communication. The role of the Safeguarding Officer will often require that they act as a pivotal point for a variety of agencies. An understanding of the roles of these agencies and the tools that they use will facilitate a fast, appropriate and effective response to a situation. By the end of this module, you will understand the role of the Local Safeguarding Board, Safeguarding Partners, Gateway Team or Protection Committee, and how the various statutory and other agencies should work together. It is the right of families experiencing the safeguarding or child protection process to make a complaint if they feel the need. All complaints should be given equal attention, and part of the role of the Safeguarding Officer is to ensure that the policy for dealing with complaints is appropriate and fair. By the end of this module, you will have a greater understanding of the process for complaints, and how to process a complaint or allegation in the right way. Using a range of scenarios, you will now take all that you have learned and apply it to an assessment of your knowledge. The final assessment is your opportunity to show how much you have absorbed and why it is so important to have safeguarding training. Once you have passed your assessment, you will be able to download your certificate. Your pass rate will be 80% but don’t worry if you do not pass the first time, as you can take the test multiple times.